Founded by brothers Nathan Peabody Ames and James Tyler Ames. Originally a blacksmith. Well known maker of knives and swords, they were the first company in the U.S. to cast bronze statues. Their sterling division was sold to Gorham around 1872, although their mark continued to be used for many decades. Succeeded the Curtisville Mfg. Co. The name was changed to Williams Bros. Mfg. Co. when the business was sold in 1880. The name was revived by Williams Bros. in 1907 for a line of flatware sold by Montgomery Ward. Acquired c. 1940 by the Ellmore Silver Co. Flatware dies were purchased by the Crown Silver Co. Makers of sterling flatware, holloware, and jewelry. Flatware Patterns by Amston Silver Co. In the firms of Clark & Anthony 1836-1837 and L.D. Anthony & Co. c. 1850-1894. A subsidiary of Bernard Rice's Sons. 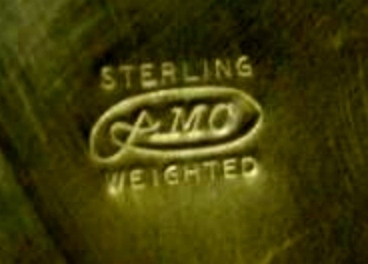 Makers of sterling novelties and silver plate hollow-ware. Sterling dies were acquired by Garden silversmiths. incorporated that same year as the James R. Armiger Co. and remained in business until around 1970. Maker of military insignia and silver-plater. Edmund Boker and Ernest Gould founded the Chicago Art Silver Shop in 1912, changing the name to Art Silver Shop in 1918. The focus of the shop changed to primarily jewelry in 1934 and the name was changed again at that time to Art Metal Studios. Makers of hand wrought sterling Arts & Crafts hollow-ware and jewelry. silversmithing trade after he was wounded during WWI. after today. The Asheville Silvercraft mark was used prior to 1929. Around 1854 and Covington, KY 1863-1906. Primarily a jeweler and retailer. Maker of sterling vanity items and jewelry. Maker of sterling and gold men's accessories and jewelry. Primarily a jewelry maker with a focus on Christian jewelry, they also make some small sterling items. Son of John Avery, Sr.
Samuel Ayres and Noah Haydon. Jameson with John D. Jameson 1817-1818. Was in partnership with Amasa M. Badger in the firm of Ayers & Badger 1835-1836. Silversmith and jeweler. Son of Samuel Ayers. Founded the jewelry business of T.R.J. Ayres & Sons c. 1871-1878.